Developed countries are flocking towards sub-Sahara Africa to lease and buy farmlands from some of the world's poorest nations. 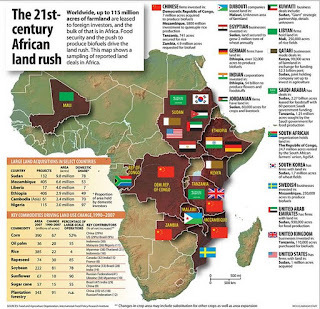 In what is now being dubbed as the new scramble for Africa, some 6.2 million acres of farmland have been bought or leased within the last 5 years alone, with Ethiopia among the highest of farmlands already leased. The government of Ethiopia states at least 36 nations, including Germany, China, Saudi Arabia, United States, Djibouti, and India have leased farmland since 2009. Over the next 5 years, it plans to increase this figure by threefold with the hopes of generating hard currency. Prices for plots of land in Ethiopia ranges from as few as $6.89 USD per hectare in the Gambella and north-western regions, to $11.62 per hectare around the Ethiopian Rift Valley. A land the size of Britain has already been leased to foreign countries, which has alaramed many Ethiopian citizens and foreign human rights advocates alike, whom believe the Ethiopian regime is exploiting its most vulnerable citizens for short-sighted profits. In the middle of all these land leases are the indigenous Ethiopian ethnic groups, who are being forcibly removed from their historical territories to make way for these foreign companies. These resettlement programs have angered Ethiopia's agropastoralist communities, who feel their lands are being taken away from them for profit. Many of these communities in the Gambella and Afar regions have even started to take up arms against government forces. While 14 million Ethiopians severely lack adiqute food and receive international humanitarian food relief, these foreign companies will make Ethiopia an exporter of food. The government argues these companies will create jobs and provide skills to the local farmers, as well as generating much needed foreign-exchange, while Ethiopian citizens and foreign think tanks claim the regime is trying to gain political favors and hard currency at the expense of the people.